Anchor Bar for the world’s best burgers and Gronks & the Shamrock for top-noitch pizzas. Riverfront park on SW edge of city is a nice place for a picnic. Superior’s hotel-motels offer convenient and economical access to Duluth’s attractions. Going east from Superior on US Hwy 53, there is a Wisconsin Tourist Center a few miles out that is a worthwhile stop for gathering information on your stay in Wisconsin. Shortly after that you encounter the exit for Highway 13 east. About a mile or two down the highway is a turn-off for Amnicon Falls if you are in the mood for a hike, a scenic picnic site or want a campsite (semi-modern with no RV facilities). Otherwise continue east on Hwy 13. The landscape is mixed woods and farm fields, away from the lake and not as interesting. 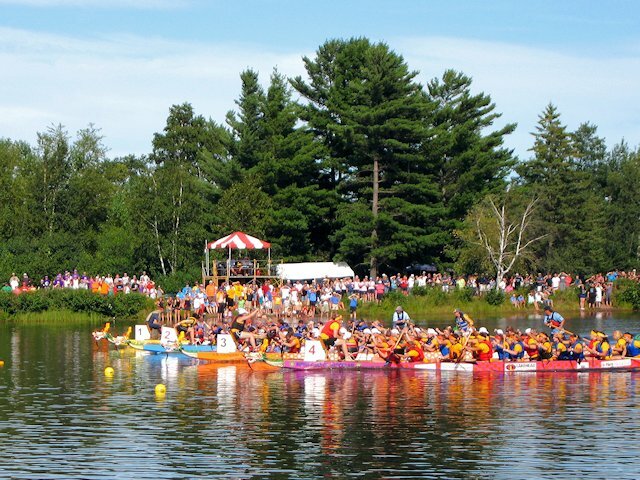 The scenic highlight of this portion is when you suddenly descend down a wooded canyon formed by the famous Brule River – one of the most popular canoeing streams in northern Wisconsin. A few miles later you rejoin the lake there are a couple of pull-overs with nice beaches and lake views. 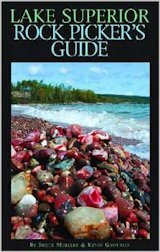 (The point where you rejoin the lake is about 30 miles from Superior, WI) The first town you encounter is Port Wing and then a few miles further down the road the village of Herbster. Each has a few artisan shops. Herbster’s township park offers both RV and tent camping. Several tent sites are right on the lake, only a few feet from the sand beach. Our favorite little community along the Wisconsin shore is Cornucopia, about 10 minutes down the road from Herbster. “Cornie” is a cute little fishing village about 18 miles from Bayfield. It’s worth at least a half hour of your time to look around and we have spent more than two hours walking along the lake and to and from “downtown” Cornie. Very attractive harbor, with a few artisan shops on the river entering the lake. Nice town park, with a beautiful sand beach and an artesian well. We get our fresh Lake Superior Whitefish from Halverson’s fish market at the Marina. There appears to be a few drive in informal camping spots at the marina, but the official campground is at Siskwit Lake a few miles south of town. We were told the sites are attractive but rustic. The Village Inn offers an attractive dining atmosphere and lodging, but we have yet to personally sample either. “Downtown” cornie offers a nice coffee shop, a historic general store, a fun bar/restaurant, and Wisconsin’s most northern post office. For travelers doing a day trip loop from Washburn, you pick up Cty C going south near the Village Inn and will be back in Washburn in about 35 minutes. About 5 minutes east of Cornie is the turn-off to Meyers Beach of the Apostle Islands Park. If you are up for a fairly rugged hike, you can see the famous Bayfield Sea Caves. Otherwise just enjoy the beach. 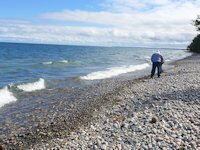 About 10 miles further down the road is another potential side trip to the Little Sand Bay unit of the Apostle Islands Lakeshore Park. Take County K to the sign and turn for Little Sand Bay. It’s a quaint community, affords a nice view of the lake and an attractive picnic area. Also there is the Town of Russell Campground (Wooded sites, suitable for tents or smaller RVs; electric hookups). Adjacent to the park is Little Sand Bay Apostle Islands Visitor Center that includes an Apostle Islands exhibit, a marina, swimming beach and a restored family commercial fishing facility (self-guided tour) Kayakers use this site and Meyers Beach as beginning and ending points for tours of the peninsula’s famous sea caves. Next stop – the jewel of the Bayfield Peninsula – the town of Bayfield. The scenic seaside village of Bayfield, Wisconsin is about 10 miles north of Washburn. Artisan shops abound in and around town as well as lots of neat places for dining and beverages. Plan to spend at least a few hours in town walking around. You could easily alot a day or more here with Orchard tours, excursion boats around the Apostle Islands, taking the ferry to Historic Madeline Island, and other entertainments. Annual Apple Festival – 1st weekend in October.